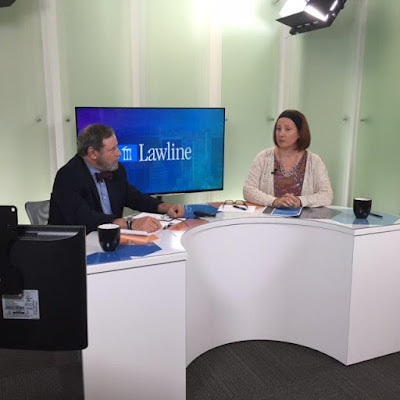 On June 9, 2015 Michelle Maratto Itkowitz and Jay B. Itkowitz presented a live Continuing Legal Education program entitled "Key Provisions in Restaurant Leases" for Lawline.com. (2) the seller-assignor no longer has an “estate in land” that is leased to another person, i.e. the assignment terminates the privity in estate, which is the interest in real property that one needs to maintain a summary proceeding to evict a lessee and take possession of a property. Id. Let us consider the fictional scenario of, Michelle’s Place, a renowned vegan kosher restaurant. After growing the restaurant’s reputation, Michelle decides to sell the business and retire to live off the proceeds from the sale. She finds a willing buyer to purchase Michelle’s Place for $1,000,000.00, of which $100,000.00 is a down payment, the remainder being secured by a promissory note that requires buyer to pay down the note in monthly installments. After the deal, buyer continues to operate the restaurant as Michelle’s Place but the quality of food and service is just not the same without Michelle, and there is also increased competition in the neighborhood. Michelle’s Place precipitously loses customers, and the buyer has trouble paying rent, let alone making the monthly installments to Michelle under the promissory note. Michelle now wants to swoop in, get the buyer out of the space, and save her beloved restaurant from certain demise. What can Michelle do? Unfortunately, the answer is not much. Assuming Michelle simply executed and delivered an assignment of lease in buyer’s favor, she destroyed the privity of estate and thus walked away from the possessory interest in the premises that is necessary to maintain an eviction proceeding. East Rest. Corp. v. Caffe Adulis Ltd., Index No. 61682/02, 2002 WL 1880253, *2 (N.Y. Civ. Ct. N.Y. Cty. 2002) (finding that lessee who assigned its interest in the lease could not maintain a summary proceeding against the assignee under Real Property Actions & Proceedings Law § 721 because the assignment destroyed privity of estate and therefore, the necessary landlord and tenant relationship did not exist) citing Anjo Restaurant Corp. v. Sunrise Hotel Corp., 98 Misc.2d 597 (1979). Of course, the Landlord will no doubt institute an eviction proceeding against the buyer, but Michelle will have no legal basis to stop the Landlord from terminating the lease with Michelle’s Place and leasing the premises to a completely new business. The best Michelle can do is sue the buyer for the balance remaining on the promissory note and hope that the Landlord will be sympathetic to Michelle’s plight and consider letting the restaurant carry on under Michelle’s management. Michelle could have avoided this mess if her attorney had counseled her to enter into a collateral reassignment. The goal of a collateral reassignment is to preserve the privity of estate between the seller-assignor and the Landlord so that the seller can take back possession in the event that business for the buyer sours and jeopardizes the seller’s brand. In a collateral reassignment the seller assigns the lease to the buyer, who then reassigns the lease back to the seller as security pending full payment of the purchase price for the restaurant. Simultaneously, the seller-assignor and the buyer enter into a sublease agreement where the seller assumes the role of Landlord and monthly rent may include the amounts owed under any promissory notes. Once the debt is discharged at the end of the sublease’s term, the interest in the lease reverts back to the buyer, i.e. to whom the initial assignment was made. If, however, the buyer fails to make payments during the sublease’s term, now the seller has legal standing to bring an eviction proceeding and take back the premises, i.e. 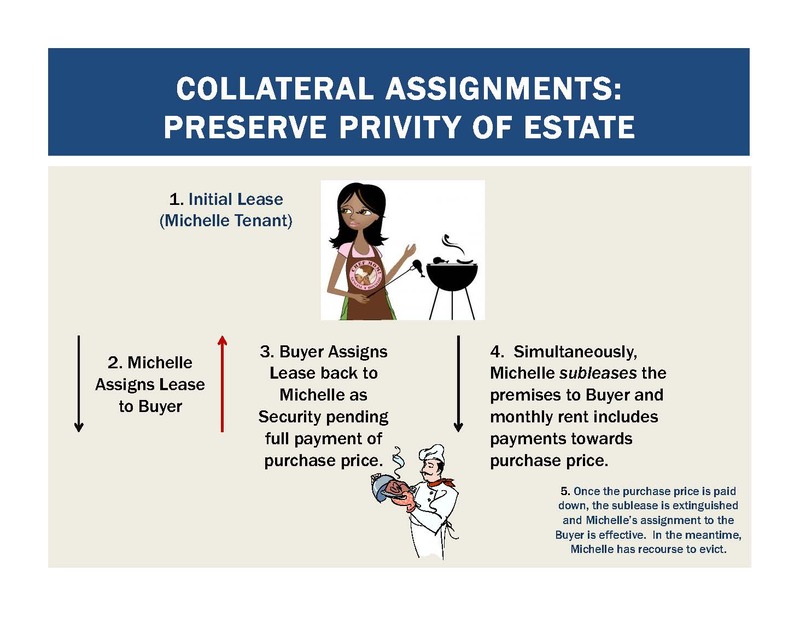 the collateral reassignment from buyer to seller conferred privity of estate on the seller-assignor. See Reb Michael, Inc. v. Southbridge Towers, Inc., 121 A.D.2d 962, 963-66 (1st Dep’t 1986) (recognizing plaintiff’s right as the prime tenant to bring a summary nonpayment proceeding against under-tenant in light of an albeit imperfectly executed collateral assignment). From the business perspective, the sale of Michelle’s Place is really the sale of Michelle’s brand that she cultivated through her hard work, marketing and culinary prowess. A shrewd Landlord will try to claim a piece of the sale price by arguing that the premium realized from the sale is really attributable to the appreciation in value of the real estate. Therefore, Michelle’s astute counsel should anticipate this tension during lease negotiations and make clear that Landlord will have no claim to the purchase price of the restaurant. If Landlord’s counsel demurs, the parties can resolve any such disagreement by arbitration at the time of the proposed sale.